Laughter makes the heat bearable. 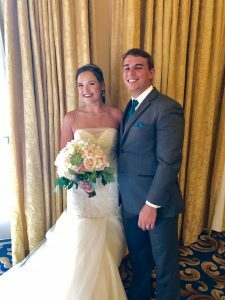 Zachery and Brianna tied the knot in a Waldorf Astoria wedding in Orlando at Walt Disney World. Orlando does not often get hot, but evening it was on fire. There were a lot of laughs and jokes as we stood in the sun and it really did make the heat more bearable. Zach walked down the aisle with Triton, the couple’s dog. Aaron with Fiora Design Studio made the ceremony look gorgeous with the tall twig trees that accented the ceremony location and the towering flower arrangements in the reception. Al Dee Productions provided the tunes that got the wedding party down the aisle and got the guests to the floor to dance the night away. Jesse Giles Photography caught every moment on her camera. From the couple getting ready, a first touch before the ceremony, the couple with their dog Triton, and the ceremony. They captured it all. I have never been more confident in any decision than I was last July. I finally gained enough confidence, and finances, to ask you to be my wife and my life was forever changed. The months and days leading up to our special day have reminded me why I feel in love with you in the first place. You truly are my best friend, soul mate and love of my life and I know that I don’t tell you that enough. I think of the time that I first met you while working for the Barnstormers back in 2014. I saw this red haired girl walk into our front office and begin talking to Laura and then walk away. I was intrigued by who this girl could be so I asked Laura and found out that it was her daughter Bree. At the time I didn’t know that she had just turned 18, but I did know that my heart skipped a beat when I saw her. After countless trips to the beer stand and team store to say hi I managed enough confidence to ask her out on a date to Chipotle and Planet Fitness and the rest was history. Our relationship has grown over the past four and half years that we have been together. From finding our best friend/son Triton from the Lancaster SPCA to uprooting our lives to move to Orlando for the opportunity for me to work in hockey, Bree has always been there by my side to support me. Through the ups and downs in my life, I know that when I get home my best friend is always there waiting for me to either cheer me up or congratulate me. From our weekly Disney dates to our family walks with Triton, every moment we share together is one that I will remember. I truly would not be the man I am today without you by my side day after day. Bree, I love you not only for who you are, but also for who you inspire me to be. Over the past four years, I have never faced life’s challenges without your unconditional love. Even on days when I have struggled, when the future seemed uncertain, not once did I have to walk alone. Thank you for always being by my side and making me a better person one day at a time. You are my everything and I can’t wait to call you my wife. The past 4 years with Zach have been some of the best. There have been some bad things that happened, some bumps in the road, but overall we’ve had such a great time. He and I moved out of our parents’ houses into an apartment, 3 apartments now to be exact. We learned how to live together, we got a dog together, learned how to be dog parents together, and we’ve adapted to living in a new state together. Nothing that we have done and gone through would be possible to do by ourselves; we need each other. Over the past 4 years Zach and I have become a team, we wouldn’t be able to go through life if we weren’t. My weaknesses have become some of Zach’s strengths, and vice versa. There is one main reason that Zach and I work so well, and that is because we are basically the same person. Opposites attract definitely doesn’t apply to us. I feel like he knows me better than I know myself most times. He knows me; he knows what I need more than I know what I need. He’s rational when I’m not but I know that I should be. He is everything that I need. I love Zach for so many reasons. Big reasons, little reasons, and every day I feel like I find a new one. He is hilarious, he never fails to make me laugh, even when I’m mad. He is the hardest worker that I know. I admire how dedicated he is to succeeding. Zach is compassionate, and I love to see that soft side of him. He is so loving to me and our dog, Triton. Zach is respectful of me, and also protective. He is just everything that I could want. Thinking about the future with Zach is so exciting. Seeing how much we have grown with each other in 4 years is amazing, and after the wedding we will have forever to grow with each other. I can’t wait to buy a house together and make it our home. I can’t wait to see the father that Zach will become when we have kids. Being with Zach just makes me excited for the future.